The balance between the food demand and availability is becoming more and more fragile in many parts of the world. To feed the rapidly growing population, there is a need for a higher production. But at the same time, agricultural yields are more vulnerable due to a changing climate. To ensure a sustained food security, timely information on the available natural resources is crucial. The Food and Agriculture Organisation of the United Nations (FAO) therefore developed a system ASIS using real time georeferenced information that allows taking timely decisions given a drought risk. Currently, FAO is supporting governments around the world to calibrate ASIS to their national conditions so that they can count on updated information for monitoring drought and developing preparedness, mitigation and response plans. One of the responsibilities of the Food and Agriculture Organisation of the United Nations (FAO) is to provide information on the food security status of countries worldwide. Established in the early 1970s, GIEWS (Global Information and Early Warning System) was one of the first key global sources of information on food production and food security within FAO. To support their analyses and supplement ground-based information, FAO has adopted Earth Observation data in their daily operations. In 2013, a system for satellite based global drought monitoring was established within GIEWS which has been up and running since then. The ASIS (Agricultural Stress Index System) provides in near real time a global overview of the impact of ongoing droughts on crops and pasture. Raw earth observation data, acquired via the METOP-AVHRR satellite, are automatically processed every 10 days to maps indicating the extent, duration and severity of agricultural droughts. The resulting maps are published on FAO’s website and can be viewed either globally or for each country separately. This online early warning system belongs to FAO’s portfolio of digital innovation projects. "The global satellite-based ASIS provides easy-to-interpret information on the status of crops and pastures worldwide for non-experts in remote sensing. Hereby, it supports FAO’s global food supply and demand monitoring work within GIEWS." The ASIS, as operated by GIEWS, relies on a number of generic global assumptions. To increase the relevance of the Early Warning indicators for a specific country or region, a portable version of the system was developed which can be fine-tuned and operated at local scale. The basic analytic units can be changed by the user, who may decide to use either administrative or agro-ecological units. Where available, local crop or crop type maps can be used to delineate the regions included in the operations. The system can be finetuned for a specific crop by including field information on the crop calendar or the sensitivity to water stress of the different growing stages. The tool allows the user to define several levels of drought categories: extreme, severe, moderate and slight. By using these tools to customize the ASIS platform to local conditions and knowledge, the information becomes more relevant for the national officers. Natural Resources Officer at FAO-GIEWS, Mr Oscar Rojas, explains “ASIS is automatically fed by pre-processed imagery. VITO Remote Sensing provides satellite data in near real time mode which guarantees the continuity of the system. Complementary to the early warning approach, the tool can estimate the regional historical drought probability based on satellite data archives since the 1980’s. This information is useful to guide public investments such as harvesting rainwater and establishment of irrigation systems." "Using ASIS on a local scale simulates the analysis that a national expert in remote sensing would undertake, and simplifies the results displaying them as maps." Nicaragua is one of the countries that already operates the stand alone ASIS. In Nicaragua most of the agricultural production is rainfed and the small farmers depend on their own production for food security. A national drought monitoring system is currently operated by an inter-institutional group populated by the Ministry of Agriculture, Meteorological Service and Research Institutions. Before, this group mainly relied on a low density meteorological network to advise the government in due time. Now, their early warning capacity is strengthened by near real time satellite data. They meet every month to analyze the information of ASIS and data collected from field visits to produce an agrometeorological bulletin. 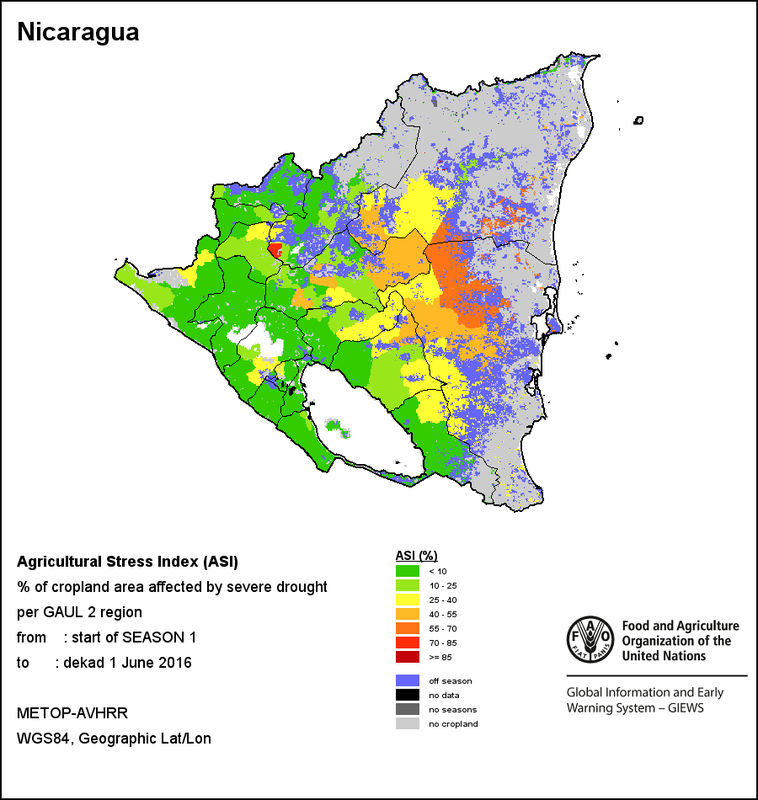 Drought overview of the Agricultural Stress Index (ASI) at the end of May 2018.